Las Huertas Golf Club, San Pancho. 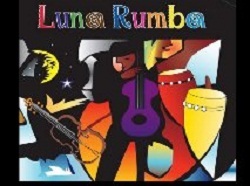 Sunset Dinner Concert with Luna Rumba. Seating is limited so reservations are required. Admission price is 100 pesos. Proceeds will benefit organizations creating educational materials and planting of native host plants to enhance endangered Monarch Butterfly migrations. You can pick up reserved tickets at the Tuesday market – look for the big blue butterfly. Dinner and drinks will be available for purchase.